Brisbane’s playground is expanding and the number of places to frolic is growing. A new social hub is popping up every other week and the city is really living up to its Bris-Vegas nickname. With all this new excitement there should only be one question on your lips, where do we go first? … Don’t worry we’ll help you decided. Who’d of thought the business corner of Brisbane could be so glamourous? Even by the standards set by its internationals siblings W Brisbane is extraordinary. The WET Deck is where we want to rendezvous on a Friday evening and its sentential suites are where we want to spend our staycations (or Friday night after a few too many cocktails). Brimming with river views, stellar design and laidback Aussie vibes it’s the hotel our dream are made of. Are you gonna pull those pistols or whistle Dixie? Creators of the bar and café definitely pulled their pistols and didn’t hold back with this new establishment. Figuratively Whistle Dixie means to fantasise in a rosy fashion, and Whistle Dixie Brisbane have literally created a space to do so. This café and bar venue is a place to fantasise until your hearts content, a place where good food meets good drinks and good times are always on offer. X Cargo is the best friend we didn’t know we were missing, until now. Made out of shipping containers, boasting multiple outdoor areas and an abundance of rooftop terraces (we’re already picturing Friday evening, cocktails in hand) she’s truly a Brisbane one of a kind. Serving breakfast and speciality coffee from 6 am before serving up lunch and dinner and that’s just the beginning. X Cargo also features an outdoor beer garden with live music, DJs, an outdoor cinema and more. Open 7 days a week we’re wondering if we’ll ever need to leave? Insane Brisbane River and Story Bridge views, luxe interiors and a paddock to plate dining experience - what more could you want?! Customs House's lavish new restaurant, Patina, has sent us in a foodie spiral with their fresh to death menu, insta-worthy cocktails and decor (hello $40, 000 light installation). 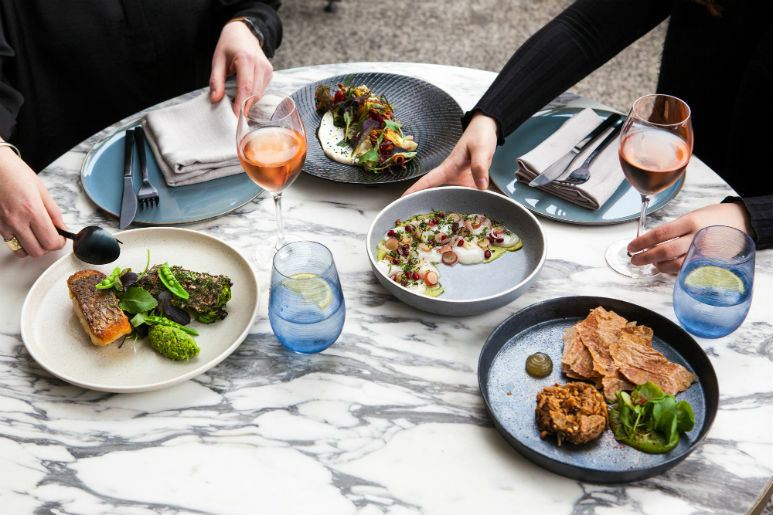 The menu is designed to be 'share-friendly' and boasts dishes like pan-fried gnocchi with roasted pine nuts, smoked raisins, kale and ricotta, and a one-kilogram OP rib from the Darling Downs served with chimichurri sauce #drool. Bring your appetite (and your camera's), Patina i snow open for your tasting pleasure! After a year of rumours and speculations the geniuses behind the Gold Coast’s Rick Shores have finally made their mark in Brisbane. Going two for two after unveiling their neo-Chinese dining hall, Little Valley. The menu features a fusion of traditional and modern Chinese dishes and if that wasn’t enticing enough the venue stocks 110 bottles of wine (we’re grabbing our key to leave right now). Its Valley location also reflects the restaurants melting pot of cultures and influences. Jocelyn’s Provisions has gotten us through some of our hardest times, like when Chuck and Blair broke up … there are some things only cake can fix. But the esteemed Brisbane local is branching out, adding savoury treats to its repertoire. Short Order is an extension of your kitchen but where all the hard work is done for you. It’s your one stop-shop for quick, healthy, delicious take-away meals and of course a sweet treat (or two). The Calile believes great hotel have stories that go beyond providing a bed for the night and we couldn’t agree more. They capture moments to be savoured and retold and with The Calile’s day spa, insane pool set up and James street location you never know what unexpected adventures you’ll get up to. One of Brisbane’s most historical sites is about to get a breath of fresh air. Located in one of the city’s most iconic locations, under the story bridge, the new riverside precinct is set to revolutionise the way we eat, drink, play and stay. Playing home to an expansive brewery, abundance of picnic areas, a new boutique hotel, overwater bar and an array riverside restaurants. Gin is the spirit of the moment so there really is no better time for Brisbane to get its own micro-distillery. You are welcome Brisbane spirit drinkers. The trio and brains behind the brand already stock their flagship gin in venues around Brisbane but the team is looking to set up permanent roots scouting an inner-city location to call home. From the school playground to the city street, two Brisbane dads turn their passion for beer into a real-life project. Set to open in the coming months soapbox is a brewpub, where the beer will both be brewed and consumed on site (how’s that for going straight to the source). We thought we could feel something brewing in the heart of the Valley. Moderation isn’t in our vocabulary and with more places to adventure than ever our diaries will be full until next year.